This weekend, I attended a conference for grieving mothers hosted by Umbrella Ministries. The conference was amazing-- encouraging, educational, uplifting and much needed! This is my Sweet Shot for the week. I loved being able to say his name and talk about him all weekend long. Did y'all know that I chose the name Christian after hearing it in an audio version of Pilgrim's Progress? His name is a reminder to follow Jesus Christ no matter life's circumstances. - yellow star for one of his favorite songs "twinkle twinkle little star" and this picture. Aw, Marsha, I am so glad you got to go. It sounds like it was a very special and healing time for you and I love your bracelet...full of meaning. i got to talking with the christian couple who owns the rafting place we went to on our vacation. they lost a young daughter to cancer shortly after you lost christian. the mom says she is only now at the point where she even wants to find a support group. i hope she will. oh, and it just occured to me when i hit post on the above comment-- i'll send her the link to umbrella ministries. i had wanted to email them anyway to tell them how much we enjoyed the rafting. I'm so glad you had a time with moms who understood where you are right now and what you're going through. I love the bracelet and the meaning behind each bead. I knew what the yellow stars reminded you of without even having to click on the link. That pic came right to my mind. Classic silly Christian. I sure do miss him! I love you Marshy! You're the best!!! i love that. i've been missing you. i'm glad you got a chance to do something like that. it sounds good. I'm so glad you were able to go to this and that it was encouraging and uplifting for you. 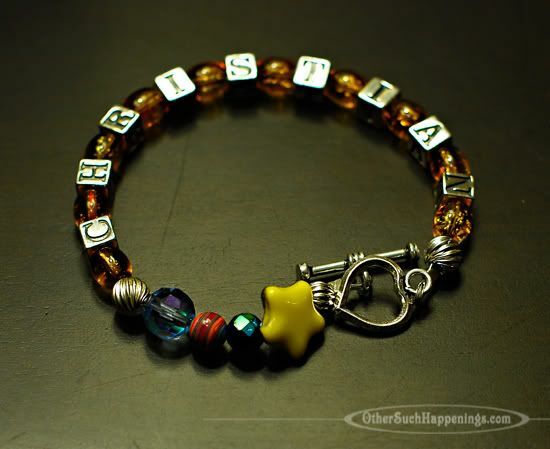 The bracelet is beautiful - what a precious way to keep those memories of Christian close to you. How beautiful. I love your sweet shot and love that you had such a healing opportunity. I'm sharing your information. Thanks. Precious. The Lord is a very present help in trouble. I've been missing you. Love the bracelet. It feels so good to say their name doesn't it? You are such an inspiration to me. I know you don't intend to make us cry when you post about your sweet Christian, but those posts NEVER fail to move me (keep 'em coming...it's good for you to share and it's good for us to hear about him). I see amazing strength in you and I can see a closeness that you have with our Father that I don't have, but definitely desire. Keep growing and sharing His love...it's very contagious. And I LOVE the beads you chose for your braclet...it's looks great! Love you and don't even know you! Well meet up in heaven though! That is a wonderful way to share your sweet Christian. I had a hard time reading the rainbow post again. It makes my heart ache to think that if those thoughts can break me down, ack, how difficult some days must be for you. I still pray for you all. And still, I cannot wait until the day when He closes the curtain on all of this. My friend's husband was diagnosed with stage 4 cancer a few weeks ago, and while I am begging God to heal him for the sake of his wife and 5 children, what I really want is for all this pain and grief to be ended and the permanent joy to begin. The only thing that holds me back are those I know who are not saved. Sometimes it's a caught in the middle thing. I know what Paul meant when he said that he longed to be with Jesus and yet saw that it was needful that he stay. What a precious ministry for an incredibly precious person. I love the bracelet. Hey Marsha! There is a family in our homeschool community that lost their 2 year old daughter last month. It has been weighing on me to maybe hook the two of you up, or ask advice as to what to offer her in the way of support. They are really struggling, and on top of the loss they have a newborn baby and 3 other children to tend to, all trying to cope. Anyway, let me know what you think. Thanks! And BTW, I LOVE your bracelet! Beautiful bracelet! Glad this conference was so great for you. Ohhh, I love your Christian bracelet. Sounds like a really special conference, Marshie. I'm glad you got to go. Beautiful..... I can not wait till I can make mine at the retreat this April.